One of the world's most prized culinary delicacies, the famous Perigord black truffle, could soon be off the menu. Scientists fear it will be wiped out by an invading Chinese truffle they have discovered growing in European soils. They tell the New Phytologist journal that the incomer is a particularly aggressive and fast-growing species. The Perigord black truffle is one of the most highly regarded truffles, fetching around 600 to 800 euros per kg this season. "It is the most famous and appreciated among the black truffles, and is the most important truffle in French cuisine," says Claude Murat, a fungus expert based at the University of Torino, Italy. Only Piedmont white truffles fetch higher prices. Yet, its very existence is now threatened by the Chinese black truffle, a close relative that looks similar, but has almost no taste at all. A team led by Murat has discovered this alien species growing on a plantation in Italy, meaning it is now growing in the wild in Europe. "We dreaded it and it has happened," the scientists warn in their research paper. The concern is that the Chinese invader will out-compete its revered European relative. 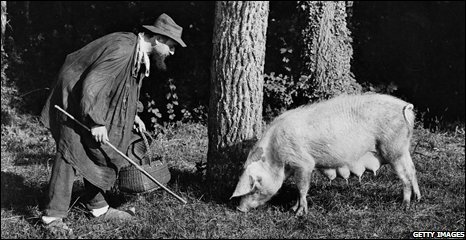 Worse, it may even be able to interbreed with the Perigord black truffle, potentially replacing it altogether with a hybrid. True truffles are fungi that belong to the genus Tuber, and they live symbiotically with the roots of host trees. Perigord black and Piedmont white truffles not only have exquisite colour, taste and odour, but are considered to be powerful aphrodisiacs. 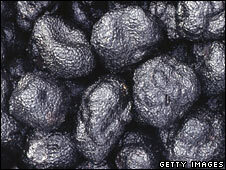 Over the past century, harvests of the Perigord, scientifically known as Tuber melanosporum, have declined greatly, with annual sales falling from over 1,500 tonnes in 1870 to less than 100 tonnes today. This has created a gap in the market, which since the mid-1990s has increasingly been filled by sales of the inferior Chinese black truffle, known as Tuber indicum. European connoisseurs are concerned because while imports of the Chinese black truffle are sometimes legitimately labelled as T. indicum, often they are not, with Chinese truffles being illegally passed off as Perigords. Now it seems that the two truffles will become ecological, as well as commercial, competitors. "The owner of the Italian plantation contacted us in 2006," says Murat. He had planted hazel and hornbeam tree seedlings that he thought were inoculated with the Perigord truffle fungus, "but after 10 years hadn't harvested a truffle". A survey by Murat's team revealed both Perigord and Chinese truffles in the root tips of the plants, and also in the soil. "It's the first evidence that T. indicum has been used to inoculate seedlings implanted in Europe, and that this species can spread in European ecosystems," he says. The future of the Perigord black truffle was already in danger as a result of falling harvests. While the team cannot yet be sure that the Chinese black truffle will supplant the Perigord in the wild, "it certainly represents a future danger", says Murat. Lab tests show it grows faster, has a higher genetic diversity and can respond better to different ecosystems and to climate change. And when a root is inoculated with both species, the Chinese black truffle is able to replace its rival. In a bid to avoid that, Murat's team is now studying the genome of the Perigord black truffle. "We hope this important project will allow us to preserve this delicious product," he says.